It may be what many women dream of, but it’s as rare as hen’s teeth – and the truth is that a perfect body is a myth … at least in the conventional sense. But whilst acupuncture can’t make the imperfect perfect, it can definitely help you to look and function better. Perfection is such a subjective concept, isn’t it? My idea of a perfect day and your idea of a perfect day could be – and probably are – two completely different things. The perfect holiday could be a narrow boat on the Broads for one person and a month in Fiji to another. And the perfect physique? Well, good luck getting any sort of consensus on that subject! Fashion changes like the wind, so what’s considered to be beautiful today may be different to what is considered attractive tomorrow – just ask the women from the Renaissance! I personally believe the human body, every human body – male and female – is a glorious collection of beautifully imperfect things – and never is that truer than for the body you can’t see in the mirror … especially for women. The life expectancy for the average woman in the UK is now between 82 and 83 years. That’s a long time for such a complex, organic machine to work effectively. To put that into some sort of context, our body is a machine that’s made up of 100,000 miles of blood vessels – stretched out, that would reach nearly halfway to the moon. It’s 3.3 billion heartbeats, regular as clockwork. It’s 206 bones – measuring from 2.5mm (the stapes bone in the ear) to a little under 19 inches (the femur). It’s the processing of 838,000 litres of water in your lifetime. You get the drift. The 82 years of life the average woman can expect to spend in this world can be measured in many different ways, but one way is in the three hormonal, or reproductive, stages – which together last somewhere around 35 to 40 years, from puberty, through pregnancy, childbirth and motherhood to the end of the menopause. For many women, the body takes a lot of life-altering punishment in those years – hormonally and physically. So, it’s not exactly a surprise that we girls often find ourselves having to manage a body that isn’t behaving quite as perfectly as we’d like all the time. Acupuncture for women’s health is a secret weapon in trying to rebalance the combined impact of puberty, childbirth, motherhood and the menopause. As our bodies struggle to maintain their natural rhythms, we experience symptoms or conditions that can be highly unpleasant in varying degrees – PMS and other menstrual issues related to light, heavy or absent bleeding, menstrual cramping, ovarian cysts, uterine fibroids and breast cysts, endometriosis, infertility and menopausal distress. It’s a fairly daunting list. But there are plenty of studies that show acupuncture for women’s health can combat many of these conditions by regulating the hypothalamic-pituitary-ovarian axis – the body’s internal process that balances the female reproductive system. 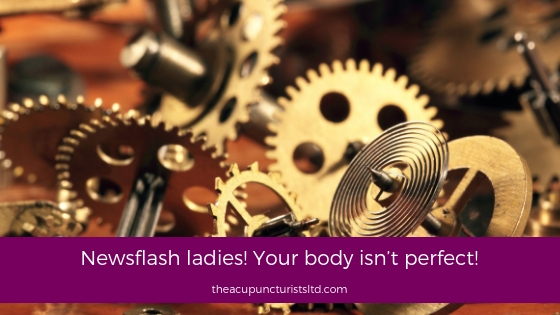 The bottom line is that our wonderfully imperfect bodies can use a little help sometimes – and the ancient Chinese art of acupuncture has two thousand years of history helping women all over the world to find a natural balance that brings harmony to their lives. If you struggle with any issues relating to ageing, it could just be that acupuncture has the answer for you.